This Fantastic 1,365 + 1,030 Sq. 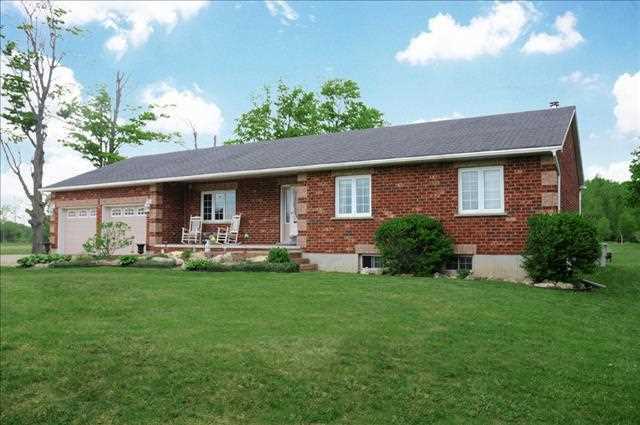 Ft. Bungalow Sits On Approx.1 Acre Lot A Paved Road In The Charming Village Of Dundalk. The Home Features 2 + 1 Bedroom & Direct Basement Access To The Garage Providing In-Law Suite Potential. There Is An Attached, Insulated & Heated Garage, Ideal As A Workshop At Any Time Of Year & A Second, Oversized Detached Double Garage, Ideal For Extra Vehicles & Yard Equipment. Finished Basement With large Family Room & Gas Fireplace. Beautiful Sunroom With Window Surround Providing Spectacular Sunset Views, Eat-In Kitchen With Pantry, Under Cabinet Lighting And Pull Out Shelving, Covered Front Porch, Easy Clean Windows & Much More! A True Masterpiece With No Detail Over Looked! This Breaktaking 4,292 Sq. Ft., 4 Year Old, 4 Bedroom Custom Built Home Is Full Of Every Upgrade You Can Imagine Located On A 1 Acre Property In Caledon. Each Area Is Filled With Luxury From The Dream Kitchen With Superior Finishes & Top Of The Line Appliances To The Show Stopping Yard With A Marble and Granite Tile Lined Pool & Multiple Deck/Patio Spaces One Being Off The Master Bedroom. 5 Fireplaces, Heated Floors, Wide Plank Herringbone Patterned Hardwood Floors & Marble Heated Floors. Quartz, Marble and Granite Counters. Beamed & Cathedral Ceilings, Antique Touches, Upgraded Lighting Through Out, Upgraded Baseboards, Crown Moulding And Multiple Built in Book Shelves or Display Units. The Feature’s Available In This House Can Go On. A Must See And Truly Spectacular Property Inside And Out! This Wonderful 1025+581 Sq.Ft. 3+1 Bedroom Bungalow Sits On A Large Corner Lot In One Of The Most Sought After Areas Of Orangeville. Finished Walk-Out Basement Provides Separate Entrance, 3 Piece Washroom Renovation 2009, Open Concept Kitchen, Living & Dining Room. Kitchen Boasts Maple Cabinetry, Smooth Top Range And Stainless Steel Dishwasher. Over $10,00 Spent On Amazing Professional Landscaping, Spectacular Water Feature, 2 Mini Barns And Also A Garden Shed. Shingles 2011 Eaves Troughes And Soffit 2011, Furnace 2012, Freshly Painted, Newer Windows And Doors, Upgraded Light Fixtures And Much More! Wonderful 3 Bedroom Bungaloft In Shelburne. Impressive Custom Kitchen With Stone Backsplash, Centre Island & Walk Out To Rear. Master Bedroom On Main Level With 4 Pc Ensuite. 2 Bedrooms And 4 Pc Washroom In Loft Area. Part Finished Basement With Bar & 2Pc Washroom. Vaulted Ceilings, Gas Fireplace, Oak Hardwood Floors, Owned Water Softener, Fenced Yard, Landscaping, Garden Shed, Direct Access To Garage, Central vacuum, Central air conditioning & Much More! Fantastic 3 Bedroom 2 Storey Home Located In A Quite Subdivision In Orangeville Close To Shopping, Park And Schools. Master Boasts Double Closets, Dining Room Has Walk Out To 12X12 Ft Raised Deck And Fenced Rear Yard, Kitchen Comes Complete With Smooth Top Range And Refrigerator. Wonderful Approach To Home With Mature Trees. Shingles New (2010), Furnace New (2009), Windows New (2009), Front Walk Way (2013), Central Vacuum (2014), Owned Water Softener & More! This Stunning 3 + 1 Bedroom Detached Home Offers 1,599+665 Sq.Ft., A Pool & Close To Schools, Parks, Shopping, Transit & Highway 410. Eat In Kitchen With Stainless Steel Appliances & Walk-Out To Beautiful Backyard With Covered Patterned Concrete Patio & Pool. Master With Walk In Closet & 5 Pc Ensuite With Upgraded Double Vanity, Soaker Tub & Seperate Shower. Finished Basement Boasts Large Family Room With Built In Wall Unit, Bar & 3 Pc Washroom. 2 Pc Washroom Renovation 2013, Stunning Front Doors 2013, Central air conditioning, Central vacuum, Painted 2013, Upgraded Lighting, Garage Door 2013, Crown Moulding, Upgraded Baseboards, Hardwood Floors & Much More! This Wonderful 1,717 Sq. Ft 3 Bedroom 3 Bathroom End Unit Townhouse Is Close To Shopping, Including The Vaughan Mills Mall, Transit & Highway 400. Eat In Kitchen With New Appliances 2013 & Walk-Out To Rear 14X10 Deck & Master With Walk-in Closet & 4 Pc Ensuite, Soaker Tub & Separate Shower. Open Concept Living & Dining Room, Gas Fireplace, Washer, Dryer New 2013, Cold Cellar And Rough In Washroom In Basement And Much More! Wonderful 2 Bedroom, 1079 Sq. Ft. Detached Home Close To Schools, Recreation Centre And Shopping In Orangeville On Oversized Pie Shaped Lot. Kitchen With Centre Island, Breakfast Bar, Pantry And Stainless Steel Fridge And Open Concept To Dining Room & Family Room, Walk-Out To Deck. 2nd Floor Laundry With Front Load Washer And Dryer & Unfinished Basement Awaits Your Imagination With Rough Washroom. Shingles 2010, Central Air Conditioning, Central vacuum, Parking For 4 Cars, Owned Water Softener, Reverse Osmosis & Much More! Pride Of Ownership In Every Room! This 4 Bedroom 2 Storey Homes Sits On a Premium Pie Shaped Lot With Easy Access To Hwy 410 And Further Features An In-Ground Pool! Eat In Kitchen W/ Granite Countertops, SS Appliances New In 2009, Ceramic Floors And Walk-Out To Rear. Fully Landscaped, Fenced Rear Yard Has Pond, Deck, Cedar Pool House & Pool Boasts New Pump, Heater & Filter 2012. Master With Upgraded Ensuite, Shingles 2010, Cathedral Ceilings, Hardwood Floors 2012, Upgraded Bathrooms, Oak Staircase, High Efficiency Furnace, Rough-In Washroom In Basement, Gas Fireplace, Upgraded Light Fixtures, Recently Painted 2013, Window Coverings, Central Vacuum, Central Air Conditioning And Much More!